Leading a finance department is not easy in today's dynamic business environment. In fact, according to a recent Robert Half Management Resources survey, roughly two-thirds of CFOs said being a business leader today is more challenging than it was five years ago. Only 4 percent said it’s easier. However, the research also found a silver lining for executives: Their employees appreciate their work. 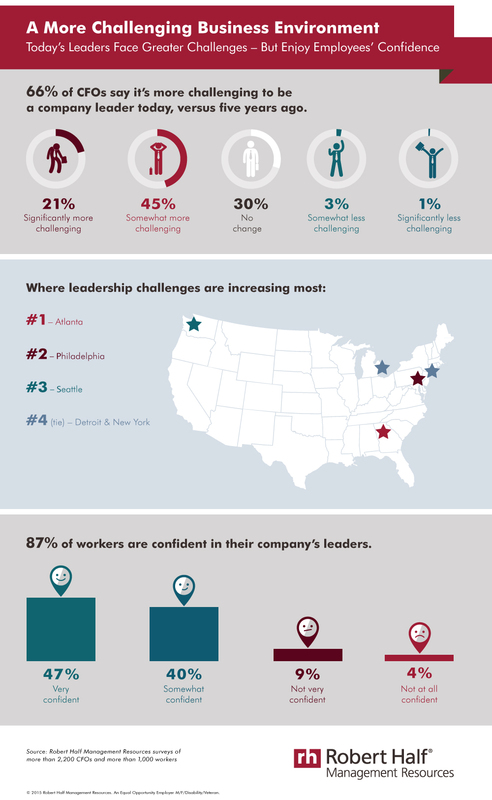 Nearly nine in 10 workers (87 percent) said they are confident in their company’s leaders. Following are seven challenges facing leaders and their teams today and the attributes financial executives need to address them. As CFOs whose work outside of finance has expanded in recent years know well, executives are no longer tasked with just overseeing their department. They must draw on their strong business acumen, understanding how their unit’s decisions and performance affect the broader organization. Managers need to engage and build trust with a workforce that often includes team members in different locations. Leaders must be adept at reaching across geographies — and frequently, time zones — to build trust with employees and learn how to motivate each person. Building a skilled team in the face of candidate shortages and retention concerns requires special talents. Business leaders today are tasked with fostering relationships with recruiting sources and developing an effective staffing management strategy, blending full-time personnel with specialized professionals who can be brought in on-demand. The unprecedented amount of information available to companies today is a potential boon to the corporate decision-making process. However, its advantages can only be exploited by executives who understand the data they need, how to obtain it and how to turn it into actionable guidance. Firms face threats not just from traditional competitors, but also increasingly from organizations disrupting the marketplace with new business models. Organizations need leaders who can anticipate changes in the competitive landscape and inspire innovation to stay on top. Regulatory pressures continue to mount for many industries and companies. Executives today need to be experts on the mandates affecting their business and understand how compliance is more than meeting a set of requirements and can instead help the firm prosper. As history has repeatedly shown, technology can change everything at a moment’s notice. The onus is on business leaders to monitor the technology trends affecting their organizations and positions and adapt accordingly.